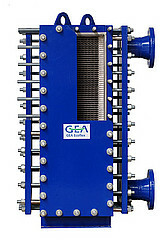 We offer you a wide a range of heat exchangers for heating, cooling and freezing applications. Soldered heat exchangers are made of high quality steel sheets. Plates are connected with each other either with copper or with nickel soldering. 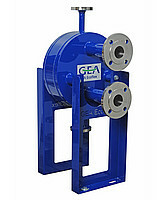 Plates are closed air-tight with each other and can therefore stand both high operating pressure and temperature. Plates of the heat exchanger are inverted by 180° relative to each other. Small gaps in the corners of the plate form two channels where liquids flow in opposite directions. Pre-insulated heat exchangers differ from the regular heat exchangers mainly because they come from the factory with an insulation shell attached around it. Dismountable heat exchangers have the same operating principle as soldered heat exchangers: 180° inverted plates with round openings in the corners make up two channels within which flow liquids in opposite directions. An advantage of dismountable heat exchangers is that they can be precisely adjusted according to the required conditions. Every dismountable heat exchanger is manufactured according to the client’s requirements; there is no mass production here.